The 2015 general election campaign was rife with promises. Amidst those made about immigration, the NHS, and Britain’s relationship with Europe, we also heard repeated pledges from party leaders that their campaigns were – and would remain – positive. The reality, however, was quite different. By the start of the short campaign, many Tories were expressing concern that the party’s negative campaigning was having a detrimental effect on support and would prevent David Cameron from securing a majority in Parliament. Cameron was quick to defend his party’s positive message, but his defence sounded hollow when he went on to warn the public of the potential dangers of an SNP-Labour alliance in the same interview. Someone listening to that interview might have questioned the Prime Minister’s definition of a negativity. While his statements were arguably not overly personal or derogatory, his message was most certainly negative in that it contained a less-than-flattering message about his party’s opponents – and that is the classic definition of a negative appeal. Discussing your opponent(s) can take many forms. For example, you might refer to their policy positions, qualifications (or lack thereof), or in the case of a sitting MP, to their previous record. But the content is almost always negative in the sense that it focuses on the weaknesses of the opponent. But David Cameron was not the only leader who was pushing a message of positivity. In January, Labour had vowed to avoid negative posters and personalised adverts, citing a desire to raise the tone of the campaign. Ed Miliband publically committed his party to this vision in his election broadcast, stating “we are the optimists in this campaign. And my experience of political campaigns is that optimists win and pessimists lose. That’s why we are going to win this election.” But this pledge did not stop Labour from going negative. Attempting to fight a battle on two fronts, Labour attacked the Tories and Ukip in the England and the SNP in Scotland. Again, it seemed a very odd definition of a positive campaign. But it was not just the main parties that made these promises. Nigel Farage committed his party to a positive campaign, citing his lack of faith in the negative tactics traditionally employed by the main parties. “This negative campaigning, I don’t think it works. We have quite deliberately got some positive messages coming up in this election campaign.” Nicola Sturgeon was also keen to praise her party’s ‘positive message’ for Scotland. Positivity was a nearly universal campaign promise, but did any party actually keep it? To answer this question we analysed more than 3,000 2015 general election leaflets uploaded to Electionleafets.org. Our dataset includes leaflets from all of the major parties and covers nearly 70 per cent of the constituencies in England, Scotland, and Wales. In addition to the looking the issues that parties mentioned and the types of images they included, we also looked at whether the party employed negative messages and which parties where targeted in those messages. Our analysis reveals that no party can credibly claim a positive campaign, but that some came closer than others. 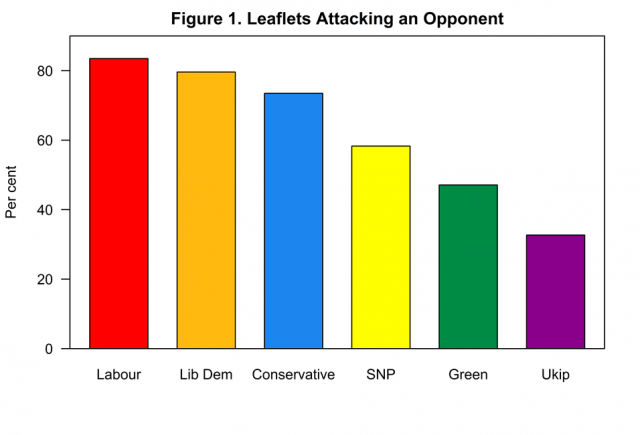 Of the parties we looked at, only Greens and Ukip tended to have more positive leaflets than negative. In both cases, less than half of those parties’ leaflets included an attack on another party. And of the two, it was Ukip that was the most positive. Just one third of the Ukip leaflets we examined had a negative message. Thus, it appears that it was Ukip that came closest to keeping its promise of a positive campaign – at least in terms of its leaflets. All of the other parties had more negative leaflets than positive. But even though the Tories were widely criticised for their negative messages, it was Labour and the Liberal Democrats that employed negative messaging most frequently. Eight out of ten of the leaflets that we examined from these two parties included least one message attacking the policy positions, record, or qualifications of another party (see Figure 1). As we might expect, most of the attacks from both parties were directed at the Conservatives. Nearly 80 per cent of Labour’s leaflets attacked the Tories, while 60 per cent of the Lib Dems’ leaflets did the same. Cameron’s party, which received far more criticism for their negative tactics, was actually less negative than his primary opponents. The Tories were 10 points behind Labour, and 5 points behind their former coalition partner. That being said, the Conservatives certainly were not running a positive campaign. Nearly three out of four of their leaflets that we analysed contained an attack on another party, and generally, that party was Labour or the SNP. Of the Conservative leaflets that contained an attack, 75 per cent had an attack on Labour and 50 per cent contained an attack on the SNP. Our analysis also reveals that certain types of areas were also more likely to receive negative messages than others. 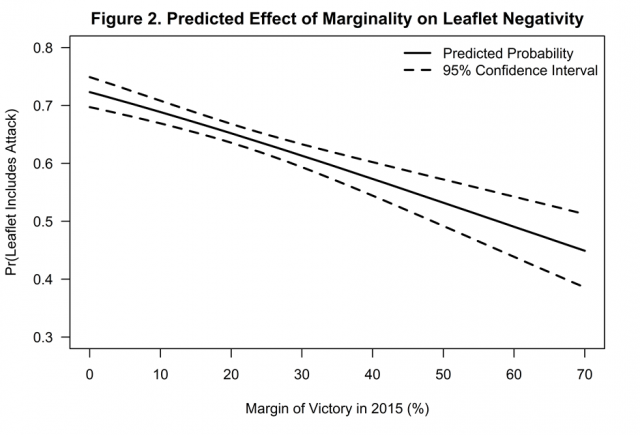 Even when we control of the authorship of the leaflet and a number of key socio-demographic features of the seats, we find that leaflets from marginal constituencies were more likely to contain a negative message. 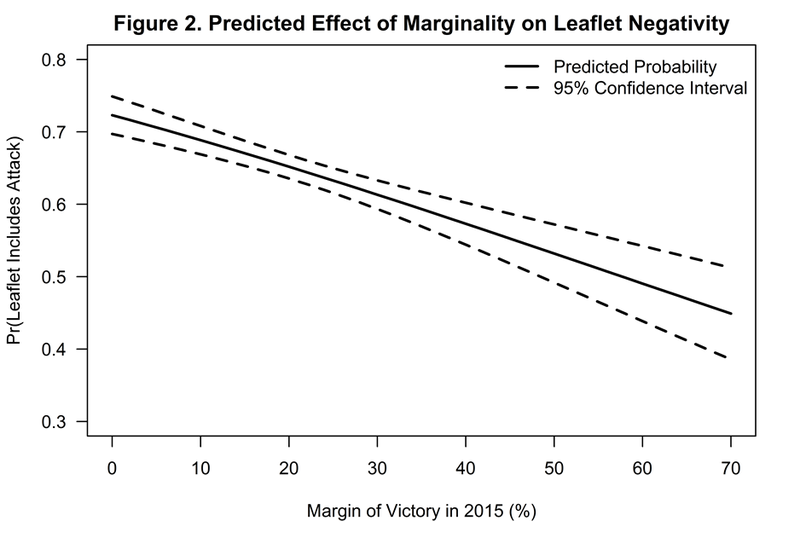 Figure 2 displays that predicted probability that a leaflet contained a negative message in constituencies of varying levels of marginality. It shows that the difference between marginal and safe seats is not trivial. In seats that were decided by less than two per cent of the vote, the predicted probability that a leaflet would contain a negative message is 0.72. Put differently, there was more than a 70 per cent chance that a leaflet in this type of marginal seat would be negative. However, in a safer seat, the chances that a leaflet would be negative decline significantly. In seats where the margin of victory was more than 30 points, the probability that a leaflet would contain a negative message drops to 0.61 – that is, there is a 60 per cent chance that leaflet from this type of safe seat would contain a negative message. Our data reveals important new insights about the use of negativity in the campaign materials disseminated by British parties. All parties go negative, and they do so more in particular places. Whether we should punish them for it is another matter. We have already seen in this series that voters get more information from negative messages. Perhaps that means that our parties actually did us a favour with their negative messages. If voters – and particularly those in the key marginal seats that decided the election – were making more informed choices, then one might argue that we were better off with negative campaigning than we would have been with the positive campaigns that we were promised. Caitlin Milazzo is Assistant Professor in the School of Politics and International Relations at the University of Nottingham. Jesse Hammond is a PhD candidate in the Department of Political Science at the University of California, Davis. The British Election Leaflet Project was supported by the Centre for British Politics at the University of Nottingham. This article is part of the Center for British Politics (CPB) research series into negative campaigning. Image credit: Wikipedia Commons. Next Post Negative Campaigning Does It Help Or Does It Hurt? Surely challengers are expected to be more negative than incumbents, as they’re (by definition) challenging the incumbents’ record? It’d be interesting to see a comparison of the negativity of defenders vs. incumbents across elections. But the analysis seems almost entirely invalidated by your giving each leaflet an equal weighting, when (presumably) some had much larger print runs than others. You’d need a way of estimating the frequency of each leaflet’s occurrence ‘in the wild’ to draw any proper conclusions. How did you code leaflets as negative or positive?